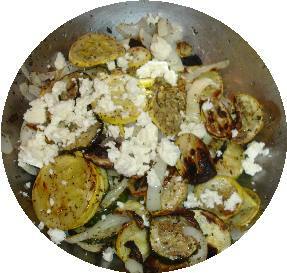 How to Make Gourmet Grilled Vegetables Easily - From Your Surplus Squash! 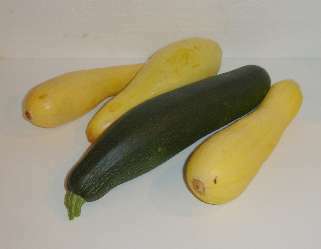 If you're like most people, you plant a few zucchini, yellow squash (crookneck or straightneck) and a few peppers... and then you have squash coming out your ears. The first week you eat it. Then you give it away. Then people run when they see you coming with more squash. Here's a really simple recipe to turn that excess squash into a gourmet side dish that you can server to the family or a dinner party. 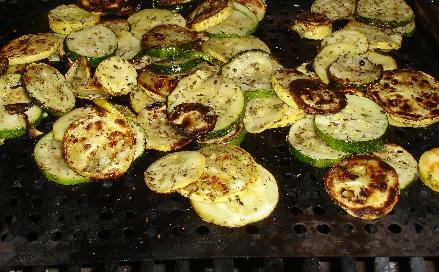 Snobs, food-trendies and crunchy-granola types will all like this, as grilled vegetables, particularly squash, is the latest trend at gourmet restaurants, AND it is healthy, low-fat, low calorie, natural, can be made from organic, sustainably-raised veggies and is also VERY tasty. Here's how to do it, complete instructions in easy steps and completely illustrated. The squash will taste MUCH better than anything you've ever had from a store. 2 tablespoons of "Herbs d'Provence" - if you haven't got this, ground rosemary and thyme will do. 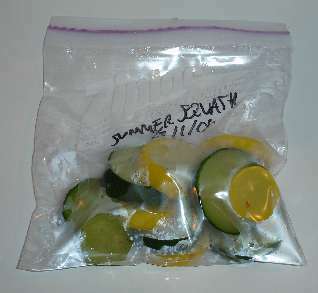 If you want to freeze it, you'll also need vacuum food sealer or "ziploc" type freezer bags (the freezer bag version is heavier and protects better against freezer burn. Step 1 - Get the veggies! 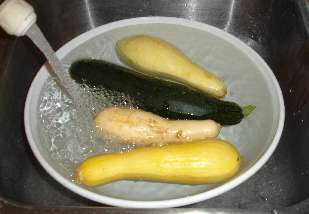 I'm sure you can figure out how to rinse the squash in plain cold or lukewarm water. Slice into 1/8th inch thick slices. 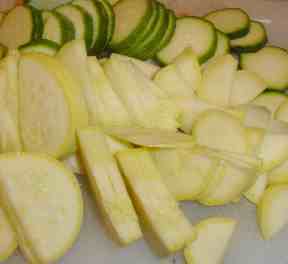 Prepare quickly, (if you leave it sit cut for more than a half hour, it will start to discolor). Do enough squash for one blanching at a time. 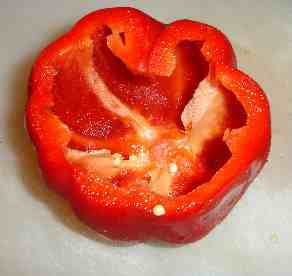 Similarly, you'll need to remove the stem end of the peppers, and wash out the seeds from the inside (seed cavity) of the peppers, then slice into 1/8th inch thick slices. Put the slices squash, peppers and onions in a bowl. Add the 1/4 cup of extra virgin olive oil and the herbs (2 tablespoons of each oregano and herbs d'Provence). Mix well and let stand for at least 10 to 15 minutes. 30 minutes is perfect. 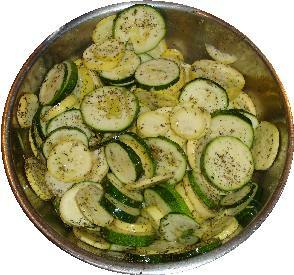 I use one of those stainless steel trays or baskets, to keep the veggies from sliding through the grill. Given them about 5 to 15 minutes per side - it really depends upon how hot your grill is. At 400F, it's about 10 minutes per side, until you see some golden brown appearing on the veggies. 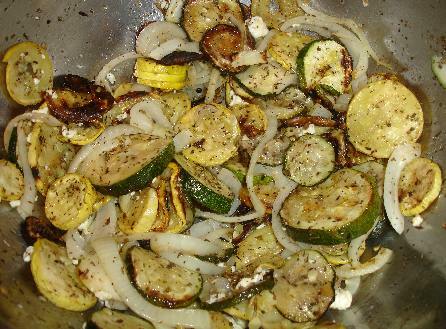 Just pop the grilled vegetables back into the bowl they were in (it's not meat, so there's no bacteria to worry about) and mix well with the 1/4 cup crumbled finely feta cheese. Do this while the veggies are still hot, so the cheese will melt a bit! 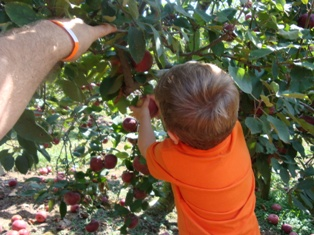 Step 8 - Serve - or Freeze! 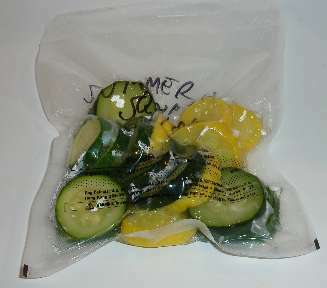 Serve them to your guests, or freeze it for the winter. An alternative method is to cook the squash first - using your favorite recipe for a zucchini casserole, or saut?ed squash, etc., and then simply freeze the cooked squash! Of course, it does take up more room in your freezer.